This open movement was pioneered by the Massachusetts Institute of Technology (MIT’s) Open CourseWare (OCW) initiative in 2001 (Brown and Adler 2008), and it has thrived worldwide. However, despite this increase in ‘openness’, people with disabilities still face significant barriers in accessing ‘open’ content. Disabilities can pose many challenges to learners who want to access learning. The need to make physical spaces accessible for students with disabilities has been acknowledged for some time. However, not many educators are aware of the challenges that learning content, especially in digital formats, can pose. For example, information differentiated solely by colour may not be accessible to a colour-blind learner. Similarly, a podcast may be inaccessible to a hearing-impaired learner unless a transcript is provided. Navigating electronic learning materials with assistive technologies that provide vital support to disabled learners can be hugely challenging unless the materials are designed with accessibility in mind (Liyanagunawardena and Hussain 2017). In this blog post, we define accessibility as ‘equal access to digital content regardless of a person’s disability’ – in many cases, access will involve the use of assistive technologies such as screen-readers. This extends the term ‘web accessibility’, coined by World Wide Web Consortium to describe the aim that goal that ‘people with disabilities can perceive, understand, navigate, and interact with the Web, and that they can contribute to the Web’ (W3C 2005). Many researchers have reviewed accessibility of academic websites and e-learning delivery sites (Kent 2015; Seale et al 2015). Over the years, the accessibility of websites and services has generally improved. However, Seale et al point out that many students with disabilities still find it difficult to manage their studies due to inaccessible learning places and/or learning materials (ibid). OER can be created by anyone and shared online, in an OER repository or elsewhere. This, then, raises the question, Who is responsible for the accessibility of OER and other freely available content? In many countries, there are equal rights legal frameworks to prohibit discrimination against disabled-citizens. In the UK, the Equality Act 2010 legally protects people from discrimination. In the US, the Americans with Disabilities Act (ADA) has, in many cases, improved access to higher education for students with disabilities. However, these pieces of legislation may not apply for OER created by individuals as opposed to courses or resources offered by institutions. Raising awareness and educating resource designers and creators can help to resolve this problem. There are already massive open online courses (MOOCs) that raise accessibility awareness and offer tools that can be used to identify and highlight accessibility issues. Examples include ‘(HE) Accessibility: Designing and Teaching Courses for All Learners’ by the State University of New York (SUNY) Empire State College and SUNY Buffalo State, and ‘Professional Web Accessibility Auditing Made Easy’ by Ryerson University, both of which are offered as self-paced courses on the Canvas Network platform. Creators of open content may not always have the skills to make their content accessible, but they can encourage others to help make their content more accessible by ensuring that their choice of licence allows others to edit and extend it. The real promise of making content accessible will lie around community rather than individuals. For example, the Coursera community of learners have translated video subtitles into more than 65 different languages. Similarly, volunteers could contribute to making content accessible by, for example, adding captions, or by highlighting instances in which there are issues in materials with respect to accessibility and, where appropriate, fixing these. If community action can be harnessed to help create accessible open content and to convert inaccessible content into an accessible form, then the accessibility of many materials could be improved to ensure that learning is available and truly open to everyone. A forthcoming book chapter, ‘Open to Inclusion: Exploring openness for differently-abled people’ – co-authored by Tharindu Liyanagunawardena, Andrew Adams and Shirley Williams – will explore these ideas further. Seale J, Georgeson J, Christoforos M and Swain J (2015) ‘Not the right kind of “digital capital”? An examination of the complex relationship between disabled students, their technologies and higher education institutions’, Computers & Education 82: 118–128. 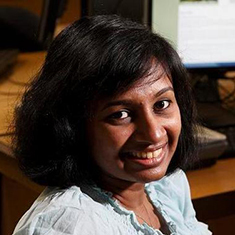 Dr Tharindu Rekha Liyanagunawardena is a learning technology researcher and the chair of the Online Learning Research Centre at University College of Estate Management, UK. Her principle interest lies in the area of the social implications of information and communication technologies, especially e-learning. She was the lead facilitator of the ‘Begin programming: Build your first mobile game’ MOOC offered by the University of Reading on the FutureLearn platform. She is a well-respected and much-cited author in the MOOC literature. She is currently working on projects relating to open educational resources (OERs), open badges and accessibility.